SKU: 123eB-s. Category: Lin's Chinese Mandarin - Bundles. 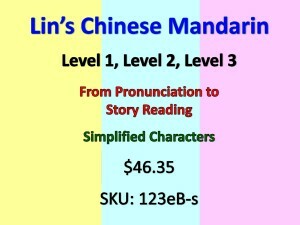 Lin’s Chinese Mandarin – Level 1, 2, and 3. Three textbook of eBooks with audio files in Chinese simplified characters with English translation. The audio files guide students to learn native Chinese pronunciation and tones. This is a set of 3 books and written for beginners 5 years old and up. 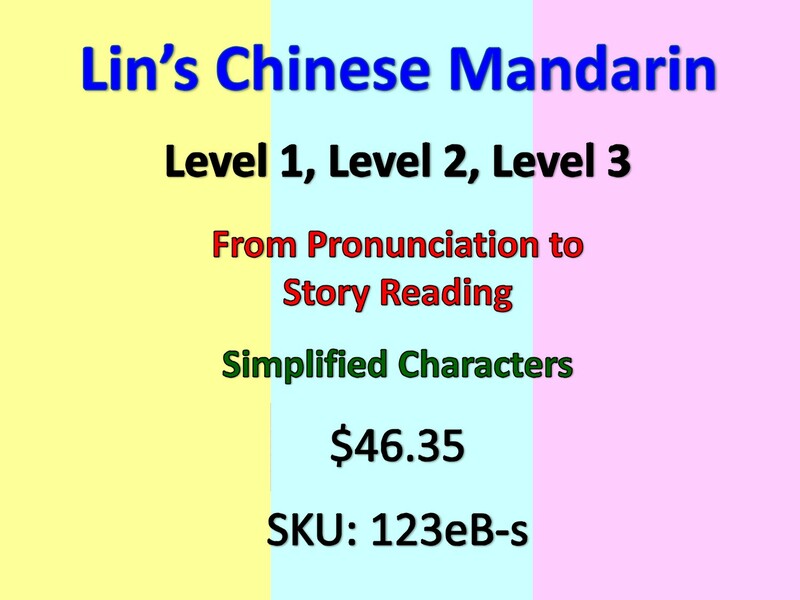 From Level 1, students learn the complete Chinese Mandarin pronunciation – Hanyu Pinyin, tones, and 427 words. In Level 2, students learn more than 1,000 sentence structure variation examples, plus date, numbers, grammar and Chinese characters with stroke order. After students finish this Level 2 book, they are ready to read stories in Level 3. Students learn Chinese Mandarin stories from reading the summer diary of a boy named Weiwei in Level 3. The Level 3 stories apply all the learned Hanyu Pinyin and words from Level 1, and phrases and sentences from Level 2 to tell stories in Level 3. This storybook is for young learners to review and establish a deeper understanding on how to use their learned knowledge. Students also learn new words, phrases and sentences from this story telling book to prepare to go to a higher level of Chinese Mandarin. When students finish these three books, they have established a solid foundation of Chinese Mandarin.